Comparatively rare 26" wheels, the original Quickly - some consider the ultimate Quickly. Small 5.5 pint 'round peanut' fuel tank, left hand exhaust, painted rims, single seat, 'Mickey Mouse' wire type centre stand. Speedo optional extra. Quite Common 26" wheels, as earlier Quickly N but with larger 'round' 1 gall fuel tank, right hand exhaust, later models had an indent in the tank side to accept tank badges instead of 'NSU' transfers. Total Quickly N's made = 539793. Quite Common 26" wheels, as Quickly N models but with chrome plated rims, extra fairing to both mudguards, side stand and speedo fitted as standard. Total Quickly S's made = 314715 . 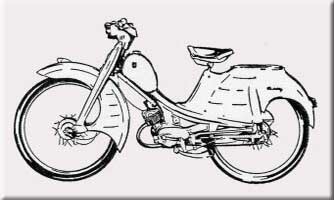 Comparatively rare 26" wheels, Front mudguard more fairing added, rear mudguard joins to the single seat saddle support and almost completely encloses the upper half of the rear wheel with luggage carrier incorporated. 1 gall. 'round' tank. 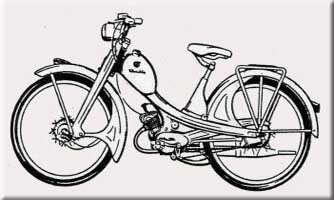 Handlebars encased in a pressed steel unit of channel section with steering head streamlined, hooded round headlamp rim, with enclosed control cables. Rear suspension units gives improved ride and entails slight modification to rear frame. Full width hubs, white-wall tyres, chrome rims, dual colour schemes and speedo fitted as standard, still with 'Mickey Mouse' centre stand. Rare and most 'sought after'. 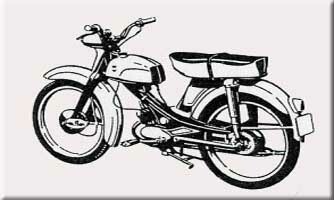 The sporty Quickly, 23" wheels, chrome rims, full width hubs, completely redesigned frame, engine with modified porting giving increased performance, 3 speed gears, sporty motorcycle look open tube frame, front adjustable telescopic forks and rear swinging arm tele-shocks, fully upholstered sporty looking dual saddle, large 2.25 gall. 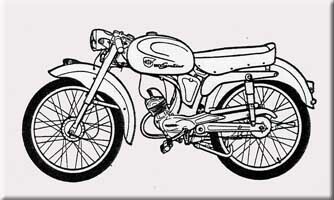 racing type fuel tank, sports handlebars, round hooded headlamp with built in speedo. Sturdy tubular centre stand, Always red and cream. Very rare in the UK. Most found in Europe. 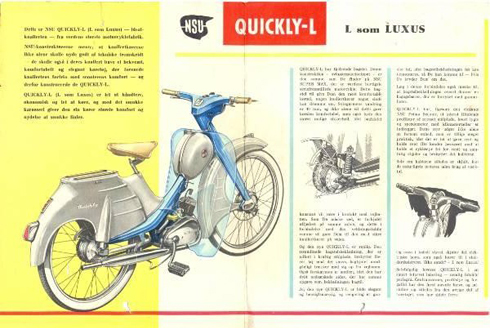 Completely redesigned frame, forks, mudguards, tank etc, To compete with the popular scooters of the time. Front and rear swinging arm suspension system, 23" wheels, fully enclosed ducted air cooling system to engine with 3 speed gears. Fully enclosed oval headlamp, horn and handlebars with built in speedo. 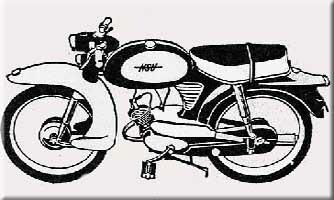 Optional single seat with luggage carrier or two seater models with rear footrests, underseat 1.17 gall fuel tank, tubular centre stand, fully enclosed chainguard. 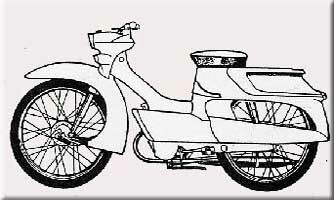 Sports moped with swinging arm front and rear suspension, normally exposed engine with 3 speed gears, sporty looking 2.5 gall fuel tank, dual seat with rear foot rests, tubular centre stand. Fully enclosed oval headlamp horn and handlebars with built in speedo. enclosed chainguard. Same as Quickly TT but with kick-start. QUICKLY S2 - 1960 - 1961 - meget sj�lden. 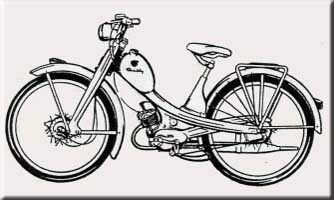 Interim model with 25" wheels and hard to find 25" tyres. 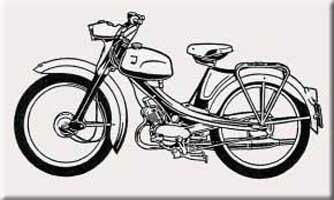 Chrome rims front mudguard with large fairings as on the Quickly L model, Rear mudguard with fairings as on the Quickly S26 models, full width hubs, new carburettor and inlet spacing, 3 speed gears, dual seat with rear footrests, tubular centre stand, dual colour scheme. 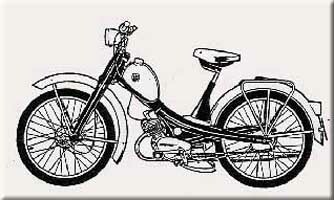 QUICKLY S - 23 - 1961 - 1965 - Comparatively common. 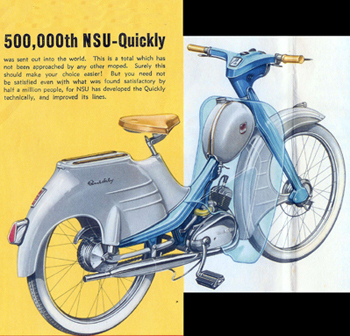 The de-luxe version of the Quickly N23, with chrome rims, streamlined oval headlamp cowling with built in speedo, and enclosed horn, toolbox is housed in enclosure casing behind saddle and above the front of the rear wheel, larger 'square' shaped 1.5 gall 'knee grip' fuel tank, optional 3 speed gears, tubular centre stand. 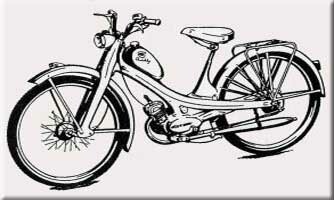 The first of the popular 23" wheel models, optional 3 speed gears, 1 gall 'round' fuel tank, round headlamp, speedo fitted as standard, earlier models had plain un-valanced mudguards, later models with valanced mudguards, tubular centre stand. 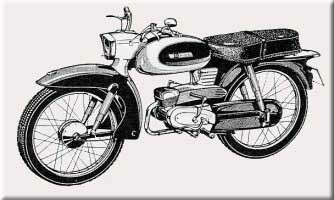 Same as S-23 but with dual seat, rear foot rests, larger rear tyre. Not really a Quickly but worth a mention here. 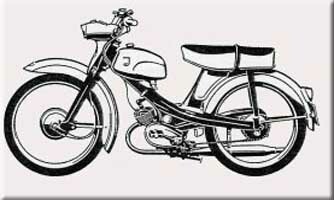 The Quick 50 was developed from the open framed Quickly TT but with a completely new 49cc engine with more power than the Quickly engine, foot changed 4 speed gears, front and rear footrests (no pedals), new type of Bing carburettor, new design front headlamp nacelle with square lens and built in speedo and horn, front and rear swinging arm suspension, lift up duel seat allowing access to air filter and space for tool roll, large 2.5 gall fuel tank. 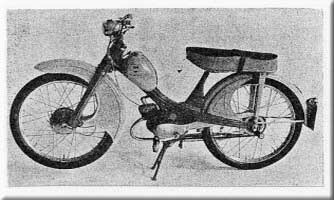 A lot of Quick 50s were exported out of Germany because of the German driving licence rules at the time, stating that mopeds had to have pedals. Some parts shared with the later Quicklys - rims, tyres, brakes, handlebars. The last of the 2 wheel NSU's before NSU wanted to concentrate their efforts into the problematical rotary engined RO80 saloon car - which ironically, cost NSU so much in warranty claims they folded and Audi/VW took over the works in Neckarsulm.